The separation of children from parents now taking place at the southern border is not new in American history. Slave families were routinely torn apart by owners. And Native American children were removed from their homes, often forcibly, and sent to boarding schools, foster care or adopted out. Carlisle Indian Industrial School, dedicated to “Kill the Indian, Save the Man,” opened in 1879. It was the first of what became a wave of residential schools aimed at assimilating Native people. The effects were shattering and lasted for generations. A new film, “Dawnland” ― named for the Wabanaki people, whose name means the people of the dawn ― tells the story of a Truth and Reconciliation Commission launched in 2011, commissioned by the state of Maine and five Wabanaki chiefs. The commission ― modeled after similar efforts in post-apartheid South Africa, Rwanda and Canada ― aimed to examine the practices that affected so many Native children and to look for opportunities for healing and change. The film is hard to watch. Children, parents and grandparents tell their stories, dissolving into tears as they describe the forced separation from parents or children, and the abuse and humiliation they endured. The truth and reconciliation process, and “Dawnland,” aim at healing. And, according to Tracy Rector, a Seattle-based media activist of Choctaw and Seminole dissent and one of the producers of the film, they had some success. I talked to Rector at the Protecting Mother Earth gathering of the Indigenous Environmental Network, which took place on the Nisqually reservation south of Tacoma, Washington, at the end of June. The removal of Native children is at the center of the film “Dawnland.” In your life, when did you first encounter this issue? My grandmother passed away from liver cirrhosis before I was born. The family story is that she was the 11th child in the family, and two missionaries asked if they could have her. Her family thought she might have a better life, so they agreed. But something about that situation brought a lot of trauma into her life, and she had a lot of depression and anxiety, and she drank herself to death. I hear similar stories throughout Native communities, although most often the narrative is that people came and forcibly took the children. When we screened “Dawnland” in non-Native communities, I learned that 75 to 90 percent of those audiences had never heard of the centuries of forcible removal of Native children from their homes and the resulting trauma. When you hear the news about immigrant and refugee children being taken from their parents at the U.S. southern border, what do you think and feel? It’s as though history and colonization are being continuously re-enacted. The federal government is trying to punish those who are coming, and taking someone’s children is about the worst thing you can do to them. There is an enormous amount of research, reviewed in scientific journals, that underscores the devastating consequences of removing children from their families, especially their mothers, even for a short period of time. And we know from working with the Wabanaki people on “Dawnland” and hearing their stories of the trauma and abuse, the trauma doesn’t stop with the child who is forced from their mother at 3 years old. The trauma trickles down to their children and throughout their community and to future generations. Separating people from their children is separating them from their future. What was the most difficult moment for you in watching “Dawnland”? For many of those interviewed, it was the first time they had spoken of the physical and sexual abuse that happened when they were removed from their families or the grief that happened when their children were taken from them. When a grandma describes sitting in a bath full of bleach water so she could get white, and crying. And feeling embarrassed that she shouldn’t be crying ― that internalized oppression was the most painful. There’s a point in “Dawnland” where the mainly white staff of the TRC, and a few others, are asked to leave during some of these tough truth-telling sessions. The film shows the pushback from that group that was excluded. Why did you include that set of conversations in the film? The directors of “Dawnland” are two white men, and they were asked to leave the room as well. People need to have a safe space, because they are digging so deep into such traumatic, emotional water. And the setting needed to be culturally safe so people could speak the truth and find some comfort, and not feel as though people were observing them. In our discussion, we agreed that including this in the film was necessary to show white fragility. Even people who truly want to be allies still allow their privilege to get in the way of understanding how to step out of the way so true healing can happen. It was hard for them to see that it wasn’t about them and it isn’t about a quick fix; it was about the individuals who were sharing their stories for the first time. Reconciliation is not immediate! Individual truths need to surface; community truth needs to happen. And once those are acknowledged and seen and heard, then the work toward reconciliation can happen. There were a couple of especially jaw-dropping moments in the film. One was a clip of a superintendent from the Bureau of Indian Affairs, in 1929, who says that the children enrolled in the residential schools are “being brought from their state of comparative savagery and barbarism to one of civilization.” What are your thoughts on how far we’ve come, or not come, in the years since? Well, the words may change, but I suspect the intention or the assumptions are still the same. We’re seeing this more and more with what’s happening politically in our country — people are emboldened to express those private thoughts; racism is happening and it is impacting our young people and our communities of color, and guiding many of the policies enacted under the guise of making America great again. Were the Wabanaki communities happy with the film? The initial response to the draft was a complete surprise to the directors. Many of those who came to the screenings from the various Wabanaki communities were incredibly unhappy. In the talking circle after the film, there were tears and anger. The criticism centered on the role of a woman, who was white and was a part of the TRC process. The directors focused on her because it raised issues of white privilege. But by having her so centered in a Wabanaki story, the narrative shifted from being about the community to being about her. The directors, Adam Mazo and Ben Pender-Cudlip, came to the conclusion that moving ahead with the film as it was would be re-enacting colonizer behavior. They needed to honor the trust that they earned and listen to the feedback of the community. The story’s better and stronger because of the changes. It’s important that communities of color have sovereignty over their own narratives. What was it like for you to be in the middle of that conversation? When they agreed to take the draft back to screen in the community, when they agreed to listen to the concerns of the Wabanaki people, and then to enact changes in the story, it was healing for me as an Indigenous filmmaker. I saw that there are allies willing to do the hard work that is needed in order to build bridges and to collectively move forward toward greater healing of the society. Sarah van Gelder wrote this article for Huffington Post, This New World. Sarah is co-founder of YES! 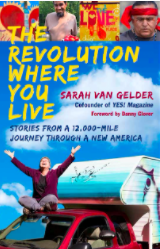 Magazine, founder of PeoplesHub, and author of “The Revolution Where You Live: Stories from a 12,000-Mile Journey Through a New America.” Follow her on Twitter @sarahvangelder. Next Post The World is Broken. Here’s How We Fix It.